The best aluminum fence is available through Gold Coast Hurricane Shutters and Fence. We can build your fence exactly how you specify. Customer service is our number one goal here at Gold Coast. Our range of designs offer elegance, practicality, and economy. Get top notch security, and add value to your property. Call us today for a FREE consultation! Aluminum fence is sturdy and reliable. We manufacture all of our products, and we pride ourselves on making the best aluminum fence in the business! We can satisfy any residential, commercial, or industrial needs. We make aluminum fences, gates, and balconies custom tailored to your specifications. Installing an Aluminum Fence from Gold Coast, provides sound security as well as adds market value to your home. We look forward to satisfying your fencing needs for many years to come and we guarantee our work 100%.. Fence contractors and fence companies serving Broward, Palm Beach and Miami-Dade Counties all prefer Gold Coast fencing products, and so would you! Our Aluminum Fence will be custom-made in accordance with your preference and specifications. We offer ornamental. decorative designs, contemporary style, art deco style, or traditional, stately designs. It will turn out to be extremely attractive, elegant as well as very durable and practical. 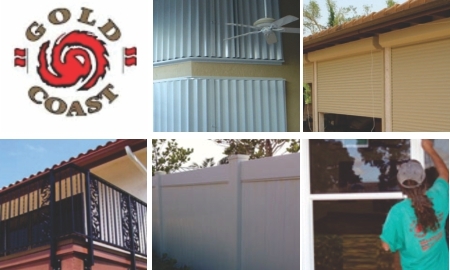 Gold Coast Hurricane Shutters and Fence is South Florida's leading manufacture and supplier of aluminum fence. We have a Gold Standard at Gold Coast, and we promise to give you outstanding customer service. Our prices are the lowest in the business because we manufacture and distribute all of our products. We offer the best selection of fences, hand railings, balcony railings, gates, and more! Your Gold Coast aluminum fence is durable and maintenance free. Whether you need that fence for a swimming pool or gate entrance, in the backyard, or bordering your property, we, at Gold Coast, will satisfy you.